Good morning all! I hope you are surviving the holiday craziness so far. My kids are driving me crazy! But I’ve been trying to let go and not be too strict since it is holiday vacation. I haven’t had time to take a breath, let alone paint my nails (my poor poor nails). 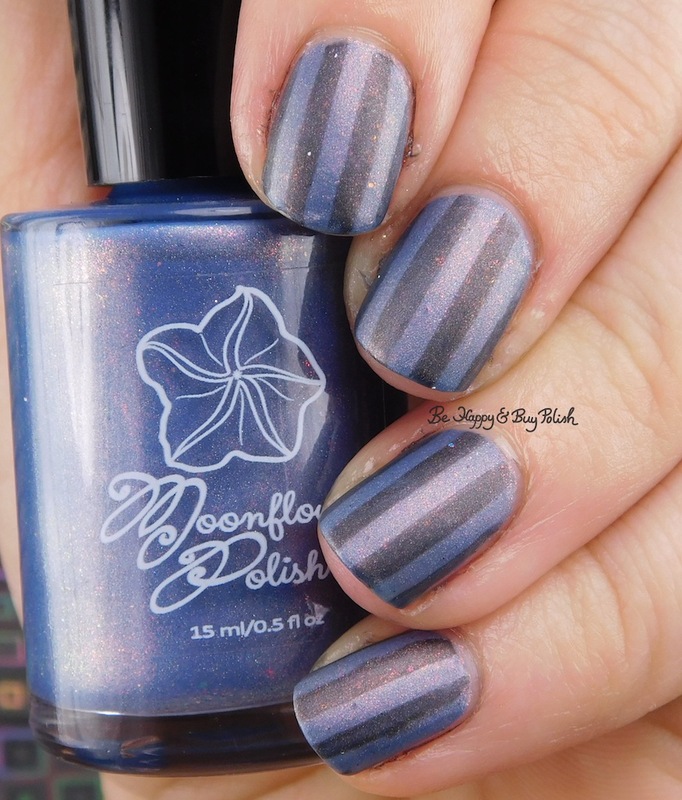 But I do have swatches of Moonflower Polish‘s newest collection: One More Light. I am so – excited isn’t the word – pleased (??) to show you this collection. 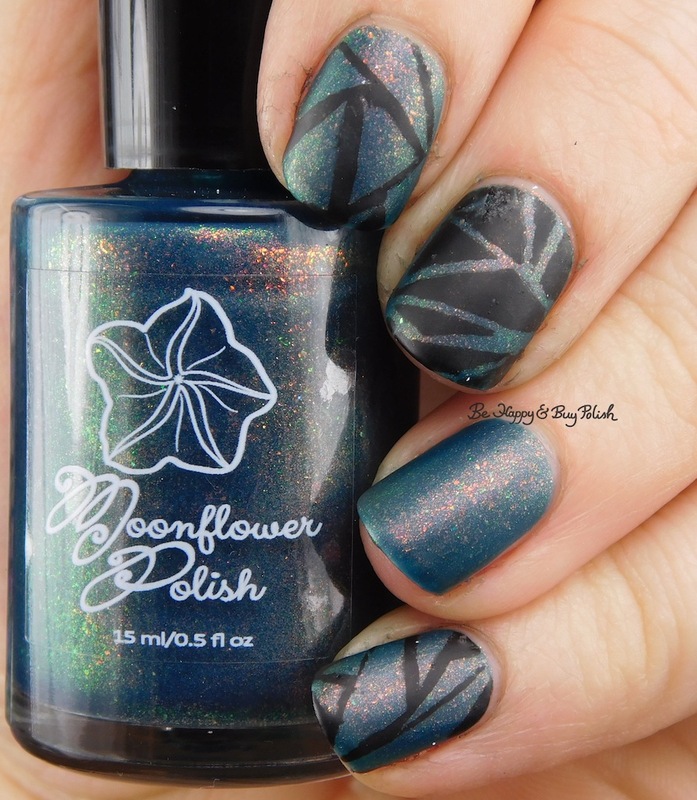 Moonflower Polish is known for their awesome stamping polishes (I’m still trying to get the hang of stamping), but Nadia and Jenalyn from Two Girls One Blush (velashaa on instagram) collaborated on this polish collection after Chester Bennington’s death. Nadia has been a long time fan of Linkin Park and was moved by his death to do something. Both her and Jenalyn have struggled with anxiety and depression and they talked through polish colors (showing the good and bad). When Nadia reached out, I jumped at the chance. Not only because I’ve wanted to try out her polish but also because of my own struggles with anxiety, depression, and postpartum depression. Let me tell you, she nailed the colors and she nailed the polishes. Let’s get to the swatches – I’ve also included some simple nail art with each polish. I’ve included Nadia’s descriptions and her reasons for each polish. 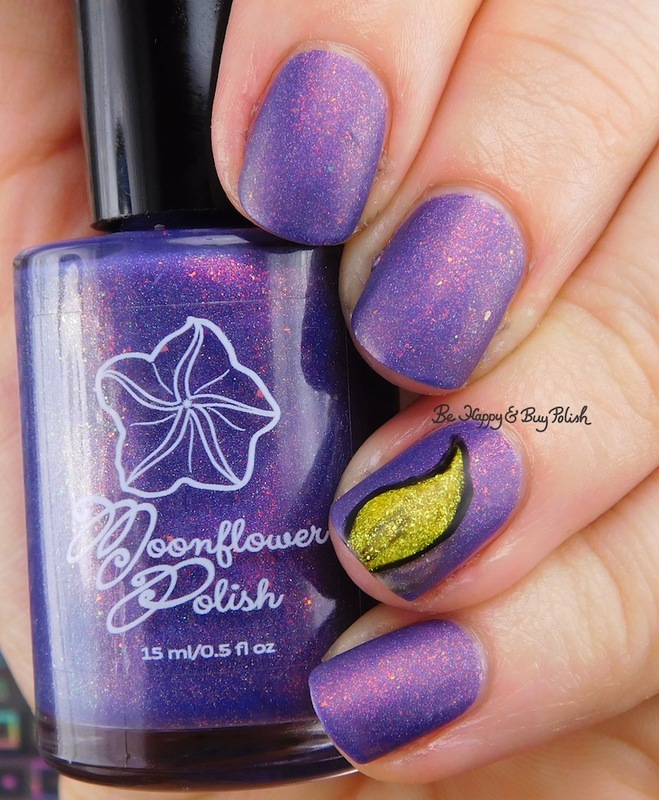 Heart and Soul is a slight holographic violet polish with blue/purple iridescent glitters. In some lights, you can see a shift to a reddish gold and sometimes to a deeper purple. From Nadia: wine jelly base with holo, purple-blue iridescent glitters, and purple-blue shimmers. This color represents my kids, they are the reason I’m still alive today, the reason I get up in the morning and fight. My son is 5 and his favorite color is red, my daughter is 10 and her favorite color is purple. This had good coverage and smooth application, it dries matte. This is 2 coats plus top coat. I’ve done some simple nail art with a black creme and Polished Vino heart fence nail guides. I sponged Heart and Soul over the black creme and it shows all the facets of HaS beautifully! I chose this nail art because with kids, it’s like my heart is on my sleeve and out there and exposed, but I wouldn’t trade it for the world. Shadow of the Day is a grey blue with slight holo, pink and red shimmer. From Nadia: bluish gray base with pink-red-gold shimmer and scattered holo. Inspired by the song of the same name as well as a picture Jenalyn took. When we are struggling, the world feels all gray and heavy, it feels like there are no more options but one. This had good coverage and smooth application, it dries matte. This is 2 coats plus top coat. I did have some raised specks that are visible in my swatches, I let Nadia know and while she isn’t sure what the specks could be, she is going to make sure that the next batch is thoroughly strained and mixed before bottling. I added some black to Shadow of the Day and used straight nail vinyls to create shadows. I know that they also look almost like jail bars and I did that intentionally. I know when I’m struggling, depression can very much feel like a jail and that I’m trapped. Everything might look fine to everyone else but I see just more darkness in the same things. One More Light is a red leaning purple with red to green glitters, holo, and red shimmer. From Nadia: a dusty purple holo with red to green color shifting shimmer. Inspired by the Linkin Park of the same name, this song is what has kept me alive on my worst days. The chorus goes “Who cares if one more light goes out? In a sky of a million stars, it flickers, flickers. Who cares when someone’s time runs out? If a moment is all we are. We’re quicker, quicker. Who cares if one more light goes out? Well I do” It reminds me that people do care about me, and I care about them. It shows the purpose of the collection, not just to raise awareness but to let others who are also suffering that we are here, there are lots of us, and we care. This had good coverage and consistency but you do need to let each coat dry before adding another to prevent dragging. This is 2 coats plus top coat. I used Sephora Formula X Turbo to freehand a small flame and added a matte top coat. Obviously the one more light symbol is pretty clear here but simple is okay. This song is a favorite for so many people for good reason. I get a lump in my throat every time I hear it – knowing what I’ve gone through, what others may be going through – what Chester Bennington went through. Do You Love Me is a smoky purple base with brighter purple shimmer, dusty blue/grey flakes, and red glow – yeah no other word for it – the red is beautiful. From Nadia: dusty blue with gray microflakes and pink-red-gold shimmer. Inspired by Jenalyn’s long time boyfriend, specifically an old shirt of his that she loves. It’s calming and helps to center her. He is her rock and main source of support, she likes to ask him if he still loves her in order to calm the chaos in her brain even though she knows she’s his world. This had good coverage and consistency, you also need to let each coat dry before adding another to prevent dragging. This is 2 coats plus top coat. I’ve used a heart guide with Polish ‘M Rose for a simple heart. I wanted to keep this simple because even though I don’t have the same struggle as Jenalyn, I know that knowing my husband loves me entirely calms me as well. A Million Thoughts is a light green that has a blue tone with red to green shifting shimmer, holo, and red glow. My macro is the most color accurate – every photo wanted to go too blue! From Nadia: greenish teal base with red-green-copper shimmer. This color represent my personal struggles with anxiety. Depression comes and goes but anxiety is always there for me. It often feels like I have a million thoughts in my head, all at the same time, a million worries and what ifs. Teal is my favorite color and very representative of me, it’s the color fo the ocean of my Caribbean home (I’m from Puerto Rico originally), it’s the color I had on my hair for a while (but it’s purple now), it’s everything to me, it keeps me grounded. This is more sheer than the others but still had a good consistency. This is 3 thin coats plus top coat. I used a black creme polish and a puzzle piece vinyl nail guide to create this nail art look. I used this to represent how I personally feel while I’m really struggling with anxiety or a panic attack. I feel almost shattered – maybe fractured is a better word. I can’t seem to pull myself together. The polishes will be $10 each, available in 15ml sizes only, the set will be $48. 20% of the proceeds will be donated to the National Suicide Hotline and Linkin Park’s One More Light fund. This nail polish collection will be available starting on January 5th at 9am at Moonflower Polish. If the initial stock sells out quickly, then the listings will change to a pre-order. I was gonna tell you my favorite but that’s such a hard decision for me. My must haves are definitely A Million Thoughts and Heart and Soul though. Thank you so much for swatching these! I love the nail art you did with them as well. These swatches are beautiful. I can’t wait to get the collection!